The questions I think we should ask are: what problem do LMSes solve, and for whom? It's fairly clear that some of the big players in the learning management system industry are eyeing the K-12 market. As schools move to take advantage of online and blended learning opportunities and as they begin to use more digital content, the LMS industry -- not surprisingly -- wants to sell K-12 schools the same product (slightly modified, of course) that they've been selling universities for years. The irony of course is that this shuffling into the K-12 market is occurring just when many universities are taking a hard look at their LMS implementations, due to the high costs and due to the sudden flood of alternatives. Even at the higher ed level, many of these alternatives don't look or act much like the traditional LMS. Startups like CourseKit and iversity emphasize ease-of-use, the open Web, sharing, collaboration, and social learning. This is all a very long introduction to Chalkable, a new startup which pitched me with the phrase "LMS + App Store." That "plus" caught my attention. After all, if we think about what problems should be solved in K-12 digital content, the App Store piece seems a far more interesting one than the LMS. In part that's because discovering quality digital content and integrating it into other systems (both the SIS and other online apps) is a big challenge. GeekDad's Daniel Donahoo has an excellent look at discovery and curation in a post this week -- "Curating Children's Content: Who's Doing It and Why?" Donahoo writes that "There is now so much media out there for children that parents and educators often struggle to know what tools are most useful for supporting children’s learning, educating them while they are entertained and have a level of quality that previously has been curated for us by other professionals." Donahoo examines the various groups -- research organizations, crowdsourcers, algorithms, the Learning Registry, and so on -- that are trying to tackle the problem of helping parents and teachers identify good educational content. Now, of course, Chalkable's creation of an App Store doesn't necessarily solve this problem for schools. After all there's already the iTunes App Store, the Google Apps Marketplace and the Android Market and so on -- indeed, more App Stores might just mean more problems. Already these stores are full of educational apps, but other than an "education" category (and maybe a few subcategories like "language learning"), it's still hard to find things let alone know if what you've found is decent. One of the challenges that Chalkable will face if it's to gain traction will be to make sure that it has a wide selection of quality apps. That's easier said than done. The discoverability issue isn't the only one that Chalkable says it wants to address. It also wants to simplify how schools pay for these apps. How do you buy apps with a purchase order? How do you distribute apps to some, but not all accounts or devices? Chalkable's solution then is a platform that is one part educational app store and one part suite of class management apps. 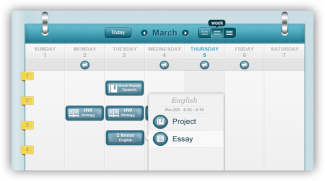 The Chalkable platform contains a messaging system, a news feed, reporting, grading, attendance and calendar tools. These tools are all Web-based (accessible on multiple devices) and fairly easy to use, and the system integrates already with most of the major school information systems. The startup -- which is still in beta -- is hoping that the ease of use, ease of implementation, low cost ($10 per student, with in turn a $5 per student app budget to start), single sign-on, app integration, and open APIs will make it something that schools and other educational app developers will want take advantage of. But with this route of "LMS + App Store," it seems as though Chalkable's competitors are pretty sizable ones: not just the LMSes new and old but the App Stores big and small. Chalkable versus Pearson, Google, Apple, Amazon, and/or Blackboard. On one hand, that makes me say "Yikes!" But on the other hand, it's clearly a huge opportunity to do things better as neither the LMS nor the App Store currently works quite right in K-12 schools.